You are required to produce a valid travel or identification document upon check-in. In case of failure to produce such documents, we reserve the rights to reject service, and last-minute cancellation charges shall apply. We do not accept children 6 years old and below in our dormitory rooms to maintain the environment of a hostel. We do not typically accept local citizens and residents. We reserve the rights to reject service to any unsuitable guests to preserve a tourist-and backpacker-friendly atmosphere. All deposits and monies paid will not be returned in the event of fraudulent cases. If you wish to stay with us, please email us directly. In case of changes to your booking schedule such as arrival/departure date, please inform us at least 7 days before the check-in date and time (calculated from the default check in time of 2:00pm Singapore time GMT+8) to avoid cancellation charges. You may cancel your reservation without any penalty up to 7 days before the check-in date and time. For cancellation within 7 days before check in date and time, full payment will be charged to your credit card. No-show is considered as last-minute cancellation. We are not responsible for cancellations or modified reservations due to booking input errors and charges will be as per our cancellation policy. Check-in time is from 2:00pm local time onwards. Early check-in is subject to availability of beds and cannot be guaranteed. Check-out time is 12:00pm local time latest. Late check-outs are not accepted. One night stay will be chargeable for late check-outs after 12pm. We reserve the right to pre-authorize your credit card prior to arrival to ensure that your card is valid and you have sufficient funds. Full payment by cash or credit card (subject to a 5% administrative fee) is required upon check-in. A refundable security deposit will be collected upon check-in for the following items: SGD 10 (per towel) and SGD 2 (per adaptor). Our dorms are air-conditioned throughout the night and ventilated with fans during the day (10am to 4pm). Please inform our reception should you prefer the air-conditioning to be switched on. We have no en-suite toilets/showers. All our facilities are shared. Lockers are provided (please bring your own lock) and towels can be rented for $2 ($10 refundable deposit required). For your convenience, you may purchase adaptors ($2) and locks for ($4). For groups of 8 or more people, please email us for bookings and savings. We are not responsible for the death, sickness or injury to any guest or for the loss, theft or damage to any guest’s property however sustained or caused. Guests are responsible for ensuring the safety of their own belongings at all times. Guests are responsible for any loss or damage to our hostel’s assets and properties. Royal Lodge @ Pagoda St. I agree with the terms and conditions of Royal Lodge @ Pagoda St.
Royal Lodge @ Pagoda Street, Singapore is a charming boutique hostel located conveniently in Chinatown, At 50 steps (we’re not kidding!) 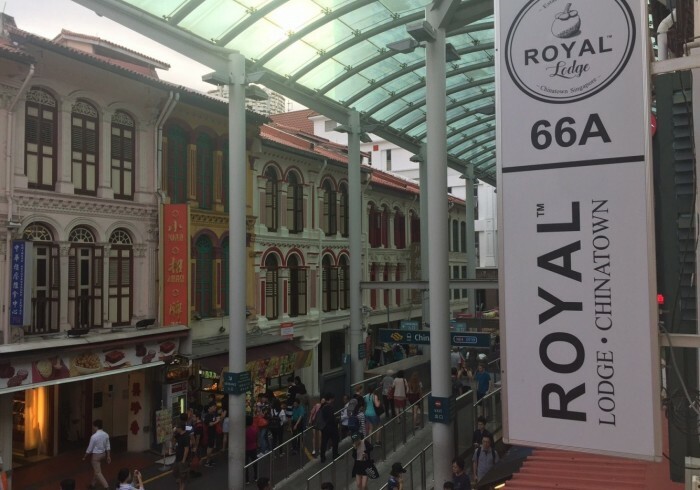 away from Chinatown MRT, we are one of the few hostels with a strategic location to allow you to get around Singapore and her attractions easily! Very ideal for backpackers, budget travellers and even families travelling to Singapore.We strive to provide you with a clean, safe, friendly and relaxed environment to make the best of your stay in Singapore, all at an affordable price. Our capacity of 35 guests fosters a perfect combination of coziness and friendliness, and you will certainly make some lovely new friends here!